« Take Our One-Minute Reader Survey & You Could Win $500! Great post! We have 5 kiddos and limited space and found so much freedom in having the same philosophy. We love it when we receive gifts which involve the relative taking one of the kids out on a special “birthday outing” to a place of their choice. The kids will always have those memories! Six months is the rule at my house. If something isn’t used in six months it isn’t very essential. As a person planning on raising my children in Asia, this is a good skill to learn. Good post! @Marlana, NO WAY!! Thank you for saying this. It made my day. Great post, now if I can just put some of it into action. Thanks for your site you have lots of great stuff! Now that you have a boy, you’ll probably find that some of your more “versatile” toys will end up being cars and trucks. We have one tub of matchbox type cars and my 2 1/2 yo son plans with them non-stop. Hours of entertainment. And the best part is that matchbox cars can often be found for $1 or even less at garage sales. But they are “clutter” when all out – we have a clean it up or it goes away approach to counter that. @Noah, Amen to that :). I have a 2 1/2 year old who LOVES his cars. He is even into talking to his airplane these days, asking it if it wants to get down from the table :). I got Silas a little wooden car the other day and he already drives it all over the house. No one showed him how and he just picked it up and started going. Cracked me up! @Noah, Same with my 2 year old. He even wants to sleep with them. They can lead to clutter but I find them easy enough to clean up — I have a special box that I just throw them all into. I am often looking for things that my sons don’t seem to want to play with so that I can give them to someone who will, but I have found that it is also useful every now and then to ask myself if they’re not playing with it because it’s not a good toy, or because they’re not ready for it yet. Depending on how long down the road they might be ready for it, I will either keep it or go ahead and get rid of it. Sometimes, too, it might be a real “creativity-building” toy, but they need me to sit down and play with them awhile to show them how to use it. I am totally with you, though, on not having more toys than you need. I’m already ready to get rid of most of our “baby toys,” even though we might have more kids in the future. I’ve realized that my latest baby is just as happy playing with junk mail or measuring cups as he is with some fancy ball that makes noises – in fact, often, he prefers the real-life objects :). we have been asking for memberships to places we like to visit. the zoo, aquarium, museums, botanical gardens in lieu of toys/etc, my relatives all see how much the kids have already and don’t mind getting a suggestion for something that we will use and enjoy. most of the time they are tax deductible donations for the purchaser and my kids get so much use and joy out of being able to go all these places. it also keeps mommy from going stir crazy all week in the house. @Rachel D., I wish my brother-in-law and his family would want something like that! Those kids have so much STUFF and we try to come up with something they might enjoy but that won’t just add to the pile! Great post! I have an 18 month old and am already finding that the toys seem to reproduce when I’m not looking! I have also noticed that my daughter delights in playing with simple household items, like empty egg cartons, oatmeal tube containers or tissue boxes. These encourage creative play and get much more mileage than the costly plastic, noisy toys. One suggestion for toy overload is to organize a toy swap with other parents. We do one with our playgroup every month or so. Each time we get together we all bring a few toys to swap, which allows our kids to experience different toys without having to own and store them. It has been fun to borrow things for a few weeks, and helps us teach out children about sharing and taking turns, which are other great lessons to help combat the consumerism of our society. we have tried to keep the kids toys limited to educational toys. Some of our favorites come from Discovery toys! They have great toys that are fun and educational. The best part is that they are gaurenteed! If they break they will replace them I love that! I second that! Discovery toys are the best. They don’t “do” much which means my daughter will spend hours manipulating the toys. We have the Measure Up Cups which she stacks then nests inside each other. In the tub she fills them with water and pours the water into another cup. It’s building simple math concepts. We also have the giant pegboard which is perfect for building “tall towers” and sorting shapes and colors. I’m not lying or exaggerating when I say those two toys are the ones she most enjoys. And I feel she is learning while playing with them. I gave my mom and mother in law their catalog and asked that they chose something out of there for my daughter’s birthday, Christmas and any other time they feel she just needs a present. I have 3 young boys, and the toys that are played with all the time are blocks, legos, cars and tinker toys. I have asked my parents and sister to give experiences for birthdays instead of toys, and they love spending time with my kids as much as the kids love spending time with them. I’m on Motherhood: The Sequel. I am raising my now 5 year old grandson. Brought him home for good at 19 months. My kids didn’t have a lot of toys but what they had mainly stayed in the playpen which was the toybox. My grandson has a closet full but nothing he has ever played with for long and most given to us. I’d say a few well thought out toys beat the multi-piece and toy overload collection. I’ve also stopped the book orders. Our library is huge and has more kids books and dvd’s, etc than any home could ever have. I so agree with you on the toy overload. It’s so common today; I can’t tell you have many families I personally that have so many toys they are tripping over them — in every room of the house. Growing up we had very few toys, (you can read about the one doll 3 of us shared, here: http://farmhomelife.blogspot.com/2009/02/my-old-fashioned-life-gracie.html) but what we remember most were the experiences and memories. We too shared your philosophy, Crystal as we became new parents 2.5 years ago. Our mistake was not being ultra-clear on this with grandparents I guess. Now I feel overwhelmed! I have an overflowing box upstairs with past gifts given that I’ve tucked away – not wanting our son to have so much and realizing how it negatively affects him. Any wisdom what to do with gifts already given to children? I hang on to them because I don’t want to offend relatives. I honestly think they buy them because it makes them feel good (although they probably don’t realize this). Agree, agree, agree! I admit, it took me a while but my minimalist husband finally got me convinced it’s a good thing to only have a small basket full of toys. Our son is 20 mo. old, so I’m sure as we have more children with a wider age span we’ll have to increase our toy basket size. Great Post! Thanks for sharing. It was very encouraging to read and know that I am not the only Mom thinking this way. I have two girls ages 9 & 7 yrs. They don’t have an abundance of toys, and never did. We used to live in a kid-friendly nieghborhood where they could ride bikes and play outside. We now live in the country on a small farm. My husband built them a huge play-set which gets used daily! They love playing outside with the animals & being creative/imaginative in their play. Several times for Christmas, my parents have given us season passes to Busch Gardens. That is a fabulous gift! They’re so good to always ask for suggestions. Great post. My son has become familiar with Goodwill as we both shop there and donate old toys and clothes a lot. I also like toys that promote active play like bats and balls, frizbees, water toys for outside, sandbox, trampoline, etc. Anything that helps get the kids outside and moving. Thank you for this post. My son is 6 months old and my husband and I agree we want him to have limited toys. For one, we just don’t have enough room and two, because we feel he will be more creative with less toys. I am glad you wrote about what to do with relatives who want to buy toys. I know my parents are going to be an issue at Christmas and birthdays and I wasn’t sure how I was going to deal with it. Those are some really good suggestions. Fingers crossed that it works! We are quickly realizing how toys can pile up. We have bought very few toys ourselves, but have been given quite a few from friends and family. We have taken some of our toys to my parent’s and grandparent’s houses. That way he has toys at their houses and I don’t have to pack any when we go visit. That has really cut the clutter a lot. I make sure to have a box for them at their houses so their houses don’t get cluttered either. My inlaws came up with a fantastic idea a few years ago, every Christmas instead of getting the kids toys, they buy us a family membership to our local zoo. It enables us to get to the zoo multiple times per year, as well as participate in zoo classes at a discount and also get free or discounted admission to other zoos/aquariums in the American Zoo Association. Another idea (courtesy of my mom) is to buy a magazine subscription to Highlights, or National Geographic children’s magazine. My oldest (5) loves getting his own mail and sits right down to go through each many times over. For my twin’s last birthday, I suggested arts and craft things for gifts. We now have what seems like and endless supply of fusion beads among other crafts. I stored most of the stuff away for a while, so when I brought it out, it was like “new crafts”. The best part is, they like crafts, and it is consumable. The body art and tatoo set was a little over the top. But I put it away and it should be fun to use this summer. We often ask for the grandparents to pull their money for a larger gift. For Megan’s first birthday it was a wagon, for her second it was a tricycle and now we ask for things such as zoo/museum passes and magazine subscriptions. A gift that keeps giving and doesn’t require me to find space for toys that may not be played with. Love this post. And I love the fact that you are sprouting your potatoes under the sink like we are for the garden (I noticed in the picture above with Silas : ). I can’t wait to start feeding our 7-month-old good, organic food that we grow. Thanks for reminding me that simple can mean happiness! Looking forward to your next post on toy organization! I definitely need some ideas. I have a small house and not much storage! At dinner the other night, I asked my 4 year old and his friend if they would rather have a more gifts or more time with their parents. Both said “more time with their parents”. Ask your kids; I bet they will say the same thing. I wanted to add to the whole “others buying toys” thing…We encourage our parents to buy memberships to the zoo, hands on museum, and other fun places for birthdays and Christmas instead of buying more toys. Or if they really think they need to purchase toys, we give them ideas for things the kids would really enjoy and play a lot with! My kids are too old for toys now, 17, 15 and 13, but we did a lot of what you did. I loved the Little Tykes stuff and we had a simple open basement, so that was their play area. I would buy their toys on clearance and then sell them at a garage sale for what I paid. They were in great condition since we kept them inside. We got a used wooden swingset and did the same thing, sold it for what we paid. I still have their Legos, Tinker Toys and books to save for the grandkids but the rest has since moved on to other families. Time flies! You inspired me yesterday to throw away 3 bags of junk! I went through my daughter’s room and found old toys she never plays with along with the daycare toy boxes. I found plenty of toys that were missing pieces and a dozen stuffed animals or McDonald toys. Thanks!!! Only took about 10 minutes too! 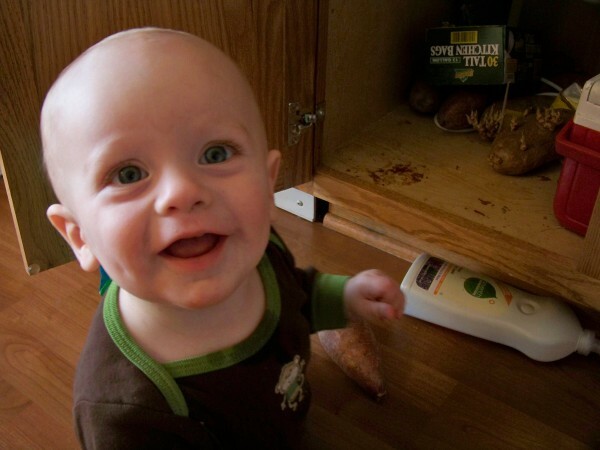 Don’t forget to watch those taters around the little one–those sprouts are extremely poisonous. We are much the same way.. we don’t have alot of extra space since we have 7 children. I find my kids don’t really want alot either. We are simple and like simple things. They play with simple toys, kinds you don’t find everyday anymore. Like old wooden trains and lincoln logs or just dolls for my little girls. I find my son will take anything and invent “something” for himself to play with. I think it helps the imagination to grow when they don’t have everything at their finger tips to play with, like all the latest gadgets and gizmos. Thanks for sharing again. DS’s bday is coming up in a couple weeks. I attempt to send out amonthly email to our family with pictures and update on what is going on in our life. In that same email I asked that no toys be bought or sent. I grew up with a lot of material things, but my relationship with my mom, especially, is not what I would like it to be (her philosphy). Both DH, myself and my inlaws agree relationships and experiences are more important. Thanks for the tips about other people giving our children toys. My daughter’s third birthday is this summer, and I think I’ve convinced my mom and sister to go together and get her a swing set instead of a bunch of little toys. She loves to play outside we just don’t have a lot for her to do outside at this point. I hope they take the suggestion. The experiences truly are better than any toy! We just visited out FD and took a tour of the trucks when they had the garage doors open. What a blast! My boys love being outside-what kid doesn’t, right? and my oldest is 2 and as long as there is dirt, he could care less even about the brand new playround equipment at any of them! I swear, all of the playgrounds have been upgraded in our area and I though he would just be thrilled…nope-he was most excited about running through the same old grass and playing in the same old dirt! haha! Oh and of course, the interaction with other children. That is the good stuff! Love it! Thanks for the suggestions on dealing with people giving toys. Good post. My children loved/love corrugated boxes to play with & in. They can be decorated, cut (by parent, of course) used for tunnels, houses, boats, planes, hiding under, puppet shows, etc. & when they get too beat up, recycle them! Nature stuffs is always a hit in our house. Love the wooden toys that encourage creativity (& they last too). This is great stuff! On a side note-how did you plan the outing for the fire station? just call them up? I wanted to do something like that with my little ones and thought about taking them some cookies or something..
A couple suggestions… our children are the only grandchildren on both sides, so they definitely are the recipients of way too much; however, over the years the family has honored our requests and been more creative in their giving. In addition to some of the alternatives to toys you listed our boys have recieved museum and zoo memberships, library cards, water park outings, camping trips, etc. They get VERY excited about these gifts and as for the first 3 listed, can be enjoyed year-round numerous times! I wanted to add also – sometimes you can ask a grandparent or relative to take your child out for a special treat instead of a toy…or pay for lessons (or part of the lessons) so that it’s an ongoing experience. Books are always welcome alternatives in our house too. I like to request memberships to museums, zoos, aquariums, amusement parks, etc as gifts for the kids. Asking for lessons like swimming or dance is also a good idea. For birthday parties it is fun to do seed planting instead of a junky party favor. Since my childrens’s birthdays are close to other holidays I am planning on encouraging them to come up with a family present for the holidays rather than individual toys. Six months ago I packed away several toys and this week plan on bringing those out again and swapping some toys back into storage. I hope to keep this going every six months during Spring and Fall, the same time we’re exchanging Spring/Summer clothes with Fall/Winter clothes. My kids both have Summer birthdays, so in a few months they’ll get a few gifts to bring some new life into their toys, and the same thing will happen at Christmas. That makes it every three months or so they’ll get new toys, or old toys that seem like new after coming out of storage. What a great idea to time it as you do! We have three installments of toys–and my girls seem to enjoy the idea that the dolls and toys go on a long trip (in the baby’s closet) and they say good-bye and all. And they love the excitement of seeing well-loved toys making a new appearance. And boy, does it help my sanity and the organization of the closet and baby cradle! Our problem really is the well-meaning relatives. We live far away from our families and for whatever reason, my suggestions of lessons, classes, etc. are met with rejection from both sides of the families. Both of my kids have upcoming birthdays, and I suggested soccer lessons for my son and a tumbling class for my daughter. My dad rejected both suggestions saying that he “hates to get them stuff like that”. He wants them to get something “they can touch”. My house is tiny and I have plenty of things that they can touch!!! Argh. The clutter really stresses me out. I’m going to purge a bunch of stuff this weekend to make room for the onslaught of birthday gifts. As a grandma, I have a suggestion. Send a note with a list of memberships, or magazines that you are looking for. Make it say something like: Please be on the lookout for deals for a zoo membership or good prices on these magazines ! “susie” really loves the zoo and it is so costly to pay for each trip. She would be so excited (and so would we) to get a year pass. or “susie” has discovered a love for animals and getting mail – these are a few of her favorite magazines – so if you find a good deal it would make a great Birthday gift. We just moved from Chicago to Dallas and I cleared out three HUGE boxes of toys and my kids are both under 3! That’s ridiculous but at least it was a wake up call – we’ve asked my in-laws to instead of sending toys, to get the kids an annual membership to the Dallas Zoo, so we can go and have fun, active family time, and they LOVED the idea! It is important to be sensitive to the grandparents situation when offering gift suggestions. My sons in-laws seem to have a large fund to draw from. They purchase beds, dressers, helicopter rides, parties for 70 kids, as well as zoo, museum subscriptions, expensive clothes etc. They have 2 grands, we have 9. They are working, we are retired. It was requested once that my husband make a small step stool for the kids bathroom. He made a beautiful oak one and spent a lot of time on it, making sure it fit the expectations. In a very short time it was discarded for a plastic Target model. Believe it or not, the grandparents are not our biggest clutter contributors! Any tips on how to deal with the toys and things given to your kids by non-relatives? Our daughter is the only little girl in our congregation and people are constantly giving her toys. My husband is the minister and it’s hard to say no, but we just don’t need more–especially with baby #2 due any day! Any ideas? @SusanE., Suggest they donate the toys to a local shelter or kids’ ministry. Why not hold a toy drive so everyone can clean out their old toys (including you!)? Then the toys would be going to a great cause. @SusanE., that’s a touchy one. Honestly, unless people are at your house frequently and will notice if the toys are there or not, I’d recommend just giving away the excess to a toy drive or a charity. Just smile, say thank you, then give it away if you don’t feel as if you can say no to folks. I’m so glad to have encouragement and advice on dealing with well-meaning relatives. I recently talked to someone about this topic and how to deal with the probably guilt of throwing out items that are not needed. Easy, just don’t have any. Guilt is self imposed. You can’t live your life wondering about what other people will think if you do something, especially if not doing so is not in your best interests. Also loved to hear that I’m not the only one who prefers bare white walls! Its just more peaceful that busy walls. I use Japanese Origami to make things out of paper. Left over magazines get turned into planes, boxes, swans and they’re never the same pattern or size. Kids love them and you turn into an instant hero esp when there are other kids around. 🙂 And my kids don’t like the toy kitchen sets when they can get real ones from my kitchen. LOL! We don’t keep a lot of toys either. I often tell people who are asking for gift ideas for our kids to “give them something to do, not something to have”. Some of the things they’ve received are Cold Stone gift cards, Pump It Up passes, bowling passes, magazine subscriptions (ok, that’s a “have”, but it’s not a toy and lasts all year), gift cards to a local rock climbing wall, etc. Another idea is to have people get your kids (or your family, particularly at Christmas when it’s not just about one person) memberships to zoos, children’s museums, hands-on science museums, etc. If the cost is prohibitive, then it can be a group gift from several relatives. It’s so awesome to have something free to do with your kids all year! Oops … forgot something! We generally hold to a “one toy in, another toy out” rule. It’s a good way to make sure that the things your kids keep are things they truly like. As we don’t buy toys, we usually do a toy purge right before or after birthdays and Christmas. Last year I decided I’d had enough of big birthday parties for awhile, so for my son’s 5th birthday rather than having a party we took a family day trip. His two favorite things are trains and dinosaurs, so we took the train from our city (Richmond, VA) to Washington, D.C. where we visited the Natural History Museum. We gave him two disposable cameras so that he could take his own photos, and we all had a wonderful time! Both sets of grandparents also met us there, so it was an extra special birthday. Before we left we let him pick one toy from the gift shop (a dinosaur, of course) and then we headed home and ate our picnic dinner on the train. He thought that riding the train was just the coolest thing ever. The train tickets cost money, but I am a HUGE supporter of the idea that experiences and memories matter so much more than things. He still talks about his birthday and loves to look through his photo album. This year we’ll be going to the Baltimore Aquarium and the B&O Railroad museum (going to visit Thomas!). We are all excited!! Love the picture of the little one in the fire truck. My son-in-law has twice asked the fire truck to come to their home when one of the grandchildren was celebrating a birthday. 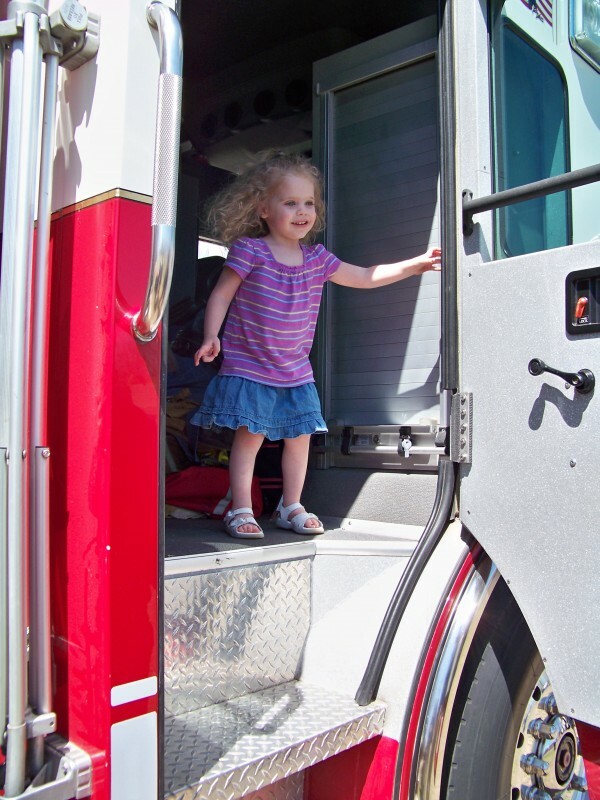 The children just love this & love touring the fire truck. I would never have thought of this idea – but it was a treat – for the children and the firemen. You can always offer the firemen some “birthday pizza” – they love it. We asked for a zoo pass last year. It cost $58 and we’ve gone at least 2 dozen times! We bring a lunch and can even bring a guest! Thank you for these posts! My husband and I have been talking about this ALOT because not only do we have a playroom with a toy box that is literally overflowing, but the kids also have toys all over their rooms! I’m sick of the chaos, but I feel “guilty” throwing away something that someone spent money on. One thing we’ve talked about is taking the money our kids get from grandparents for Christmas and using it to buy a zoo, aquarium or children’s museum pass. They will enjoy that WAY more than a toy that they’ll forget about the after Christmas! Thanks for the encouragement to get back to the simple! We have found magazine/story subscriptions to be a wonderful gift from relatives. We just suggest one the kids would enjoy. The gift goes on throughout the year, and the kids enjoy getting their own mail so much! I’d recommend Clubhouse & Clubhouse Jr (Focus on the Family), Wee Lambs & The Christian Pathway (Rod and Staff Publishers), and Highlights magazine. We like to ask for “experience” gifts such as memberships to museums and that type of thing. Fun and you don’t have to store it! I agree that kids don’t need lots of toys but after raising three sons and teaching foods and nutrition for 28 years I know that there are many things in our kitchen that we might not realize are hazards. It looks like Silas (who is beautiful by the way) is playing with soap, potatoes that are covered with dirt, germs and possibly pesticides and plastic garbage bags that could be a suffocation risk. I would suggest making a safe play cabinet filled with plastic containers and lids for stacking and sorting or pans with wooden spoons make great drums. One suggestion that you didn’t mention that has really helped with our family is group gifts. I have 4 sibblings and my husband has three sibblings, and so as you can imagine, even if they stick to simple gifts, it really adds up to quite a pile in our home. In contrast, if they all go together and get him a shared gift, it is much more managable. Some other gift ideas they have come up with have been a play doh tub and a little tykes basketball hoop– things that he LOVES, and can spend time with his aunts and uncles playing with. Cute, cute baby Silas! You have an adorable family, Crystal! Okay, you’ve inspired me. I totally cleaned out my son’s room. HUGE pile. Bigger than I thought it would be. I think the thing that did it was point number 2. He had so much in there that wasn’t sitting around for weeks on end without being touched, months on end is more like it. Thanks for the kick in the pants. What a load off. Thought this post was excellent! Time spent with my children is much, much more valuable than things. I needed that reminder. A dear mom I know once told me that if I want my teenagers to come to me with every burden or care they have, then lay on the floor and play with them now while they’re little so they will know I am always there. Living in a small apartment with grandparents many miles away, I did not want to take away the grandparents fun of bringing the children something special. I realized that our little ones spend a lot of time at church so I packed some of the washable ones and brought them to share. Fourteen years later our eighth baby is still playing with those washable, quality toys grandparents bought for the first babies and sharing them with their church friends. Funny… we still aren’t short on playthings at home. We have had such an issue with family over indulging our toddler with toys, so much so that we have duplicates. Our solution is anything that comes through our house goes straight to charity. We still need to purge what we do have. It’s nice to see other families feel like they are being crushed by the amount of toys. I thought we were the only ones.